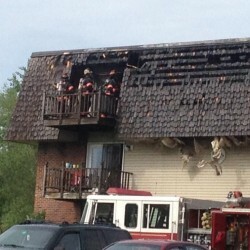 Firefighters battle a blaze at the Deerfield apartment complex on Ohio Street in Bangor on Monday morning. A firefighter makes his way down a ladder as crews investigate a blaze at the Deerfield apartment complex on Ohio Street in Bangor on Monday morning. A trio of firefighters work to extinguish fire in a third-floor unit at the Deerfield apartment complex on Ohio Street on Monday morning. 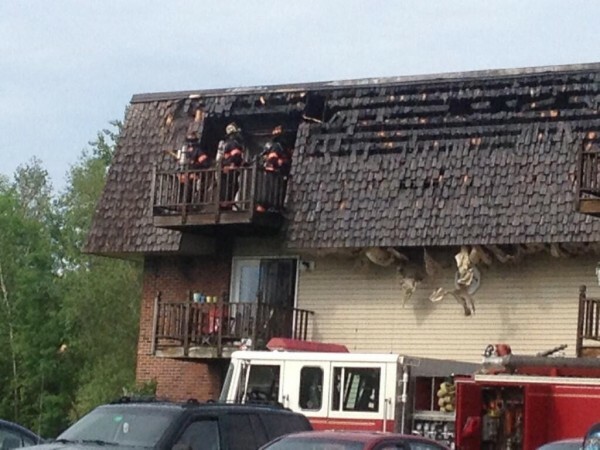 BANGOR, Maine — Several people were displaced from their apartments Monday morning as fire ripped through a 12-unit building at the Deerfield apartment complex on Ohio Street. The blaze, which was reported by a passing motorist shortly before 8 a.m., drew firefighters from three communities to the complex near the intersection of Ohio Street and Griffin Road. The complex has two 12-unit buildings. Heavy fire was spewing out the third floor of the affected building when firefighters arrived, Bangor Assistant Fire Chief Tom Higgins said at the scene. Fortunately, a quick response by firefighters kept the blaze from spreading. “There is extensive damage to the third-floor level, and lesser damage as we go down towards the first floor,” said Higgins. 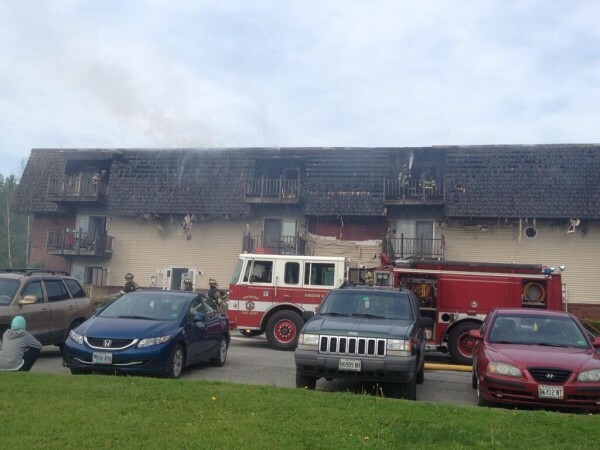 No tenants were injured, and one Bangor firefighter had to go to the hospital due to heat exhaustion, Higgins said. The fire was under control shortly after 9 a.m.
Nicole O’Clair, who lives in the building next door with her fiance and 3-year-old son, saw the engulfed building upon waking up. Even tenants in the building not affected by the fire poured out of their units as firefighters got the blaze under control. 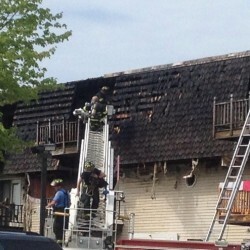 Higgins said firefighters were never concerned about the fire spreading to the complex’s other building. O’Clair said she’s thankful firefighters were able to respond quickly, as she said a lot of kids live at the apartment complex. Multiple young children were gathered in the yard with their families as firefighters got the fire under control. Bangor’s Station 6 on Griffin Road is located about a half-mile from the scene, which played a key role in the speedy response, Higgins said. The assistant chief added the building was well-equipped with working smoke detectors, which was a key factor in all the tenants escaping safely. Several cats are unaccounted for, he said. Higgins said the cause will be investigated by the State Fire Marshal’s Office, while the third-floor units suffered extensive smoke damage. 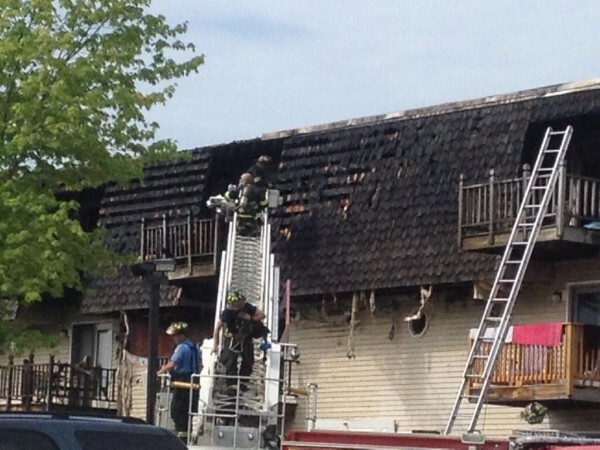 The American Red Cross has been contacted to render services to the displaced tenants, and Higgins said the building’s owner was en route to the scene Monday. Higgins did not have an exact count of how many people were displaced.